Gulf Hotels Group (GHG), Bahrain’s leading home-grown hospitality provider, has announced the soft opening of its first UAE property - The Gulf Court Hotel Business Bay. The opening is the first phase of GHG’s expansion plan across the region. The four-star deluxe hotel offers a total of 270 rooms, including superior rooms to suites, which overlook the Dubai Water Canal. Gulf Court Hotel Business Bay boasts fine-dining restaurants alongside impressive lounges and a grand banquet hall. Other facilities include meeting rooms, a swimming pool, fitness centre and spa. The hotel also has a nightclub and karaoke room for both in-house and public guests. Located 15 minutes away from Dubai International Airport, the hotel will cater to both business and leisure travellers. 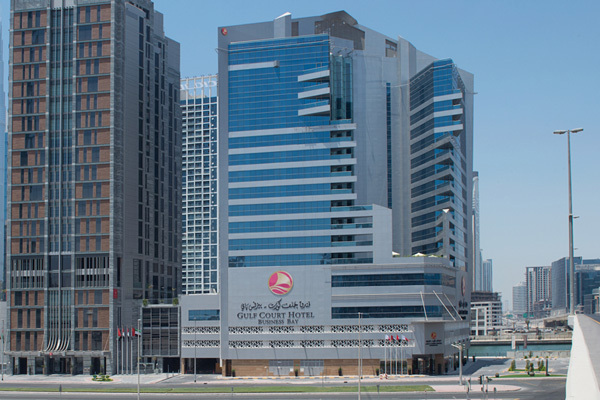 Its location is in close proximity to the central commercial and business district, and lends itself for easy access to Dubai Mall, while facing the world’s tallest building - both of which are within two kilometres walk. On August 1, the hotel opened its doors to welcome its first guests. Abdulrahman Al Hujaylan and Khalid Al Hujaylan were welcomed by the group’s director of operations, Nils Axing; the hotel’s general manager, Marc Voller; and members of the hotel’s management team. “We aim to deliver the same standard of hospitality, that has made Gulf Hotel an iconic property brand. We aim to provide all of our guests with a little taste of ‘home away from home'."